For all science fiction enthusiasts, entertainment industry artists, illustration and design students worldwide! 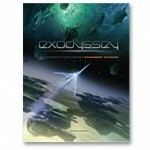 Steambot Studios presents its first original visual “art of” book, Exodyssey. A new alien race has been discovered that adorns themselves like humans celebrating Halloween. A group of unlikely heroes from Earth, consisting of prisoners, pilots and scientists, must travel light years away to confront this new race that they feel threatened by. Steambot Studios takes us on a fantastic visual journey to tell this science fiction tale. Steambot Studios, a collective of six digital artists working in the world of entertainment – Sebastien Larroude, Thierry Doizon, Joel Dos Reis Viegas, David Levy, Nicolas Ferrand and Patrick Desgreniers, takes us aboard an epic science fiction ride in Exodyssey. Created in parallel with a series of art education DVDs and lectures, the group demonstrates their creative production art techniques developed through many years of experience in the field working for such companies as Electronic Arts, Activision, Ubisoft, Epic, Digital Dimension, Canal+.. Follow the Steambot crew through an original but also realistic point of view on futuristic civilizations, space transportation and society as they visually develop the characters, vehicles, environments and props needed to tell the tale. Various educational lectures and tools are thoroughly documented in this visually stunning book. Categories: Books, science fiction/fantasy. Tags: David Levy, Joel Dos Reis Viegas, Nicolas Ferrand, Patrick Desgreniers, Sebastien Larroude, Thierry Doizon.